Many attractions open at Easter, so all top sights are open in April. Check with the tourist office of the town/regions you are visiting for more. Here are just a few of the major events, but France is full of local festivals that are diverse, interesting and always great fun. Strangely shaped kites fill the skies on the huge, wind-swept beaches of this north France resort for a week. It’s one of the biggest festivals of kites in the world, with demonstrations on the beaches, exhibitions, a kid’s village and entertainment on the piers. Maquees, concert halls and four free stages fill up for one of the first big festivals of popular music. Predominantly aimed at the young, there’s a big fringe festival as well as street art and performances in this great cathedral city. Extensive antique show on Port Vauban in Antibes for both amateur and professional collectors with international stands. This is the third major Impressionist Festival held in Normandy and in 2016 it's the turn of the Impressionist artists who painted portraits, not a subject we normally associate with the art movement of the 19th century. Check out the major exhibitions and events in Le Havre, Etretat and Honfleur, Rouen and Giverny. 80,000 enthusiastic visitors come to the attractive town of Amiens for its vast garage sale taking over 51 streets for the stalls selling everything. It's the second most important event of its kind after the famous Braderie in Lille in September. The Centre Pompidou-Metz has some blockbuster temporary exhibitions, and this one takes masterpieces around the theme of the link between visual arts and music. Some artists were amateur musicians (Wassily Kandinsky); others took music and rhythm as inspiration. Works by Marc Chagall, Sol le Witt and others are included. Now in its 25th year, the gardens at the gracious chateau of Chaumont overlooking the Loire River are once again the setting for France’s biggest garden show, lasting all summer. Garden and landscape designers from all around the world design and present a series of gardens around a theme. 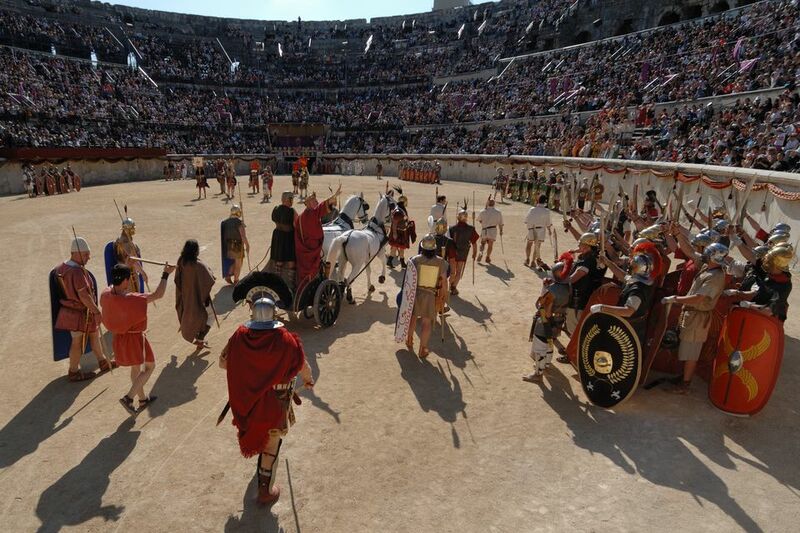 Watch the biggest re-enactment of the Roman Games in the huge Roman amphitheater in Nimes. It's extraordinary and takes you right back to antiquity with gladiators fighting it out in front of you, chariots racing around and all the fun of the fair. Throughout 2016, North France and Britain are celebrating the 950th anniversary of William the Conqueror and the Battle of Hastings in 1066.